This week's Knocked Up Blogger post for Pregnancy and Newborn Magazine highlights how we (Nick, Zoe, and I) are now moving into the high risk stage of this pregnancy. You can read all about the changes that are happening starting this week and how I try to manage the stress that comes with those changes by clicking here. P.S. Most of my ideas come from advice other high-risk moms shared with me. “I’m sorry that I’m such a complicated case,” I half teased my doctor as she directed me to lay down on the exam table to measure my stomach. We listened to the baby’s heartbeat at the clinic, where I came to be tested to see if I was leaking amniotic fluid, but I thankfully found out I just had a baby sitting on my not so strong bladder. She half smiled and replied, “You know, nowadays more pregnancies than not are complicated.” Little did I know that at my 20-something week appointment, my doctor was not only referring to me but herself as well? A week later I found out I would have to change providers as the also pregnant doctor herself had to go on bed rest for her own high-risk reasons. It was as if I was now surrounded by woman who had pregnancy complications including myself. My doctor’s comment seemed to be right, at least in my little world. During my first pregnancy I had NO complications. It was a normal 40-week pregnancy up until the last 24 hours when my daughter died. Now, because of my late-term loss, I have been labeled as a high-risk pregnancy, and starting this past week at 31 to 32 weeks pregnant is when all of my extra monitoring begins. The first part of my pregnancy was treated medically the same way that a ‘normal’ pregnancy would be treated, but now that we are approaching the home stretch (I hate that term) and nearing the time that the loss of my first baby occurred, things have gotten a little busier, and when I mean busier I mean it! I now have three doctor appointments a week; my first was this past Monday where I had what they call a biophysical profile ultrasound done. This is where the ultrasound checks for breathing, heart rate, and movement. And every Friday until delivery, I will have NST (non-stress tests) to monitor the baby’s breathing and movement, along with if my body is having contractions. Also on Fridays, I will meet weekly with my doctor for the normal prenatal appointments that occur during the final weeks of pregnancy. But this is just my experience of being classified as a high-risk pregnancy, and from my understanding everyone’s high risk pregnancy is a little different. Some are in the early stages of pregnancy due to multiple miscarriages in the past. Others happen in the second trimester, like my friend who has a history of preterm labor, some require bed rest for the whole third trimester like my doctor, and some are like me with an increase in observation by medical staff with more appointments each week. Reach out to those who have been there—This was the No.1 response from most moms who are going through or have been through a high-risk pregnancy. Reaching out to those who have walked this path before you or who are currently walking it are helpful to have around when you need someone to confide in about your deepest darkest fears that others just don’t understand. One currently expecting mom even told me about how she has a high-risk pregnancy mentor of sorts. She said that she speaks almost weekly to a mom who has had two pregnancies after a loss that have all been labeled high-risk, and having that person to call has really helped her stay sane. I think the idea is super cool. Consistent communication with doctor —This was not the No.1 response, but it did seem to make the biggest difference in people’s experience of care during a high-risk pregnancy from the moms I polled. Most women said that having consistent and frequent communication with a doctor who was supportive of their concerns during their high-risk pregnancy was the biggest factor in helping calm their nerves. I couldn’t agree more. Having a caring and understanding medical team that is available has provided me with much needed comfort during this difficult time. Ask for help from friends, family, and even employers—I know, I know. Asking for help is hard to do. I hate asking for help, but I realized in order to stay sane during this stressful time I was going to need it. I have asked my husband to help out more around the house, and I worked out a modified schedule and change of hours with my employer to accommodate my multitude of appointments. Other moms have also told me how they had to cut back on hours at work as increased monitoring occurred, or how they utilized their friends and family to help care for their children while on bed rest. See a therapist—Another idea moms reported that helped reduce anxiety and stress of a high-risk pregnancy was seeking professional emotional support. I know that ever since I found out I was pregnant again, I increased my therapy sessions with my therapist from every other week to weekly appointments so that I could have a place to process my feelings and receive the emotional support I need to get through such a stressful pregnancy. Positive Thoughts—Whether it be positive self-talk, mantras, healing affirmations, or prayer, this was another big response from expecting moms as a way to manage the stress that comes with high-risk pregnancy. I know I too rely heavily on positive affirmations and self-talk to get me through. 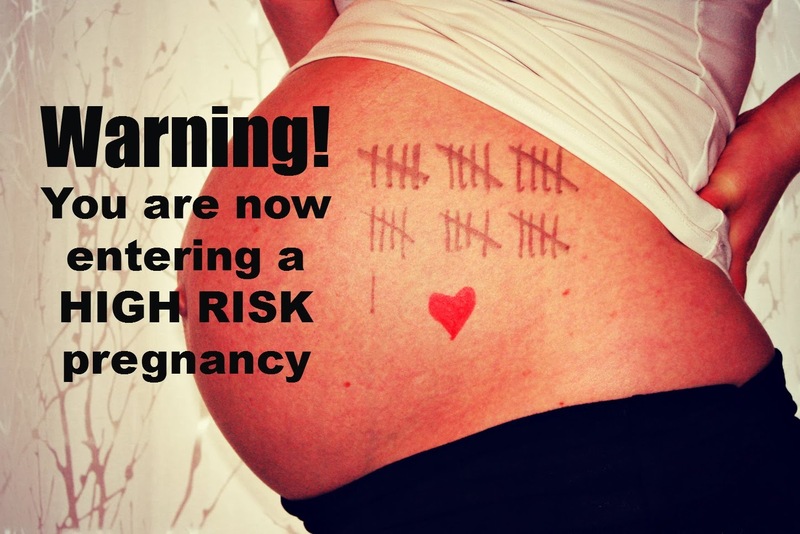 How do you handle the challenges that come with a high-risk pregnancy?